Our most prestigious tour. Cruise up a mountain in the comfort of our luxury 19-passenger, fully heated snowcat. As you spend your time in the best winter vehicle of them all you will be able to enjoy rare sights and untouched terrain. Take a sightseeing tour, ski tour or even book a gourmet fondue dinner to wait for you at the top in a cozy secluded cabin. Whistler activity discounts on Snowcat Tours here... We guarantee the lowest Whistler snowcat tour prices, so reserve online today and save your time and money. 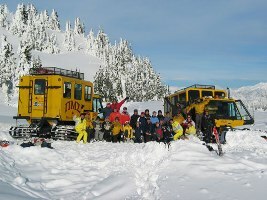 Follow this link for Whistler Snowcat Tour discounts.